Today we woke up and the sky was overcast and it was drizzling. I should have mentioned that the weather was beautiful since we arrived in St. Petersburg, even though the 10-day forecast we got in NY predicted rain every day. Sergey and our new driver (Gyorgi had other commitments) picked us up at 9:00. Our new driver is Dmitri. Donnie really wants to get Dmitri's picture because he looks exactly like a KGB agent. Big, burly, grey hair in a buzz-cut, wearing a suit. Could be he's not just our driver but also our bodyguard? We drove this morning to the town of Pushkin (named after the Russian poet) which has Catherine the Great's summer palace (yet another palace!). 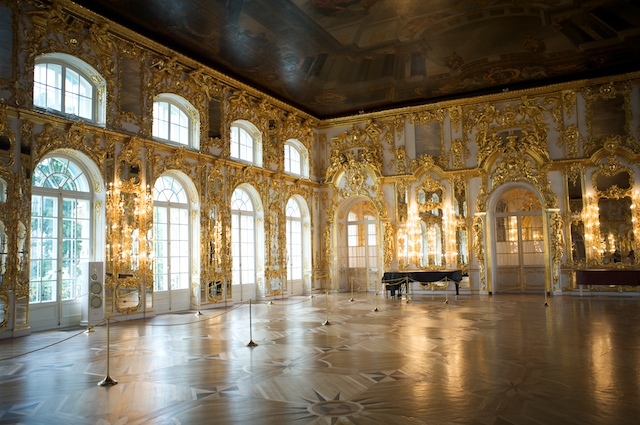 Sergey took us through the palace and gave us his usual detailed descriptions. We are getting somewhat embarrassed at all these places because Sergey, as an official guide, gets us in ahead of everybody on line. 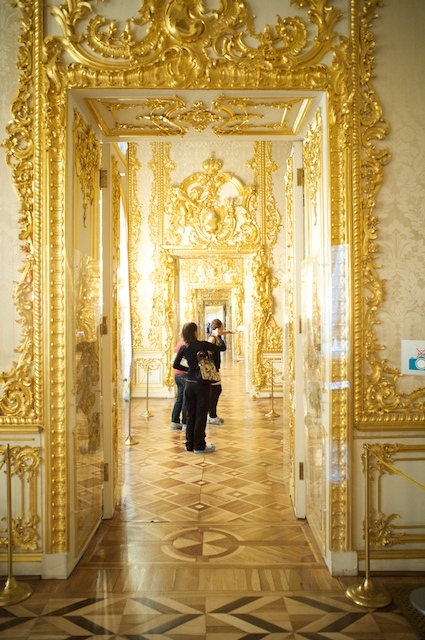 More tons of gold leaf, more parquet floors, more antique furniture, and portraits of Russian nobility. After wandering through this palace and gardens, Dmitri drove us to the next place on our itinerary - another palace! This one is Czar Peter the First's palace in the town of Petrovsk, not far from Pushkin. Slightly different - it had less gilding! I was getting palace overdose, but we made it through and drove back to St. Petersburg where we had a late lunch (about 2:00) with Sergey in a little cafeteria, and said good afternoon to him. Fortunately, by this time, the sun had come out and it was another beautiful day. Earlier, Sergey had told us, in no uncertain terms, that we MUST see the Russian Museum, which houses art by Russian artists. Since we knew that we would be tested on it the next day (Sergey is a college professor, a teacher, a lecturer and a book author). Tired as we were, we decided to go to the Russian Museum. On the way, we went past the "Church of the Spilled Blood" which was built directly on the spot where Czar Alexander II was killed, supposedly on top of the bloody stones. 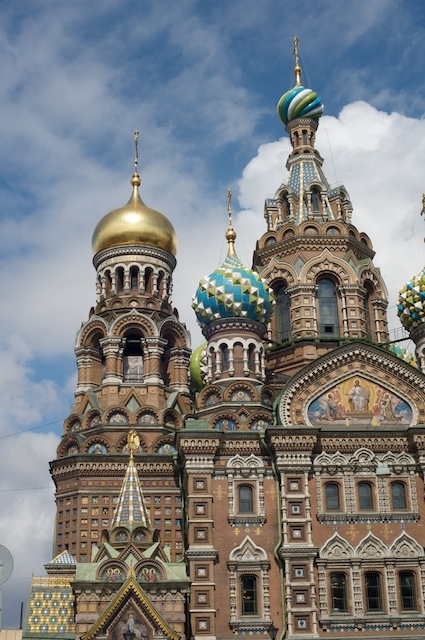 The church is very colorful on the outside and has onion domes, which Sergey finds distasteful because they don't fit the "European" character of the rest of St. Petersburg. We then walked to and through the Russian Museum, and we did see a few interesting things, but we were really too tired to enjoy it much and so after a couple of hours or so we started the long walk back to the hotel. This time we took a route that avoided Nevsky Prospekt. I am writing this in our room at about 7:00 p.m., and Donnie is napping. Later we will probably go down to the coffee shop to use their wifi to send this, and then maybe go to dinner, if we can find the energy. Tomorrow we meet Sergey and Dmitri at 10:00 instead of 9:00 so we can sleep a little later, and then they will take us to - ANOTHER PALACE!